The history of education is also the history of educational panaceas, the comings, and goings of quick fixes for deep-seated educational problems. This old problem is dramatically on the increase. The result is intensifying fragmentation of energy and effort in the schools, together with a significant waste of time and money. Education will never be improved by educational fads and the manner in which educational trends are marketed guarantees that they will be transformed into fads. In this guide, we briefly critique many of the current educational trends and fads. We focus on making the basic idea behind each of these fads intelligible so that its proper use — and likely misuse —can be taken into account. 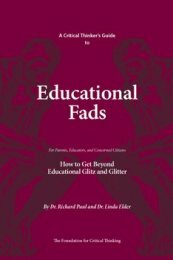 Why An Educational Fads Thinker's Guide? Most people are overwhelmed by the sheer mass of educational fads. Most educators feel pulled in a variety of directions by them. Some become passionate devotees of one of the fads at the expense of substantive education. And virtually all educational trends with any substance are transformed into fads by a flawed or superficial understanding of the basic idea behind the trend combined with a non-substantive concept of education to begin with. the likely misuse (when the idea is unreasonably applied). It It is time to recognize that education will never be improved by educational fads, and that the manner in which educational trends are marketed guarantees that they will be transformed into fads. Fads by their nature are fated to self-destruction. Parents, educators, and citizen activists need to understand the problem of educational fads so that they can effectively distinguish substantive efforts at educational reform from superficial ones. Our goal is to provide a foundation that can be used to put all educational trends/fads into immediate perspective, making it possible for interested persons to grasp the essential idea and understand the potential use and misuse of that idea. With these understandings one can make sense of discussions of educational reform issues. One can then formulate the relevant and substantial questions and seek the answers one deserves.